I recently had the good fortune to spend time with the Association of Pro Bono Counsel (APBCo), the organization whose members are charged with organizing and promoting pro bono efforts, primarily in large law firms. At their day-long annual conference, my colleague Pam Woldow and I discussed the recent teeth-rattling changes taking place in the legal marketplace, and more specifically, what it means for pro bono efforts. First, let me say that after having spent countless hours over the years with legal marketers -- by and large a sunny, lively, high-energy and positive demographic -- I was pleasantly surprised to find pro bono counsel to be as lively and engaging, with a deep passion for pro bono and a deep belief that large law firms can be leaders of change. I very much enjoyed the positive interaction and the focus on improvement during a time when sessions like this run the risk of turning to melancholy and frustration. Speaking of risk, the fundamental question presented is whether pro bono is at risk. Pro bono efforts, or offering free legal advice to those unable to pay, is an honorable practice well-suited to the community-minded attitude taken by so many large law firms. 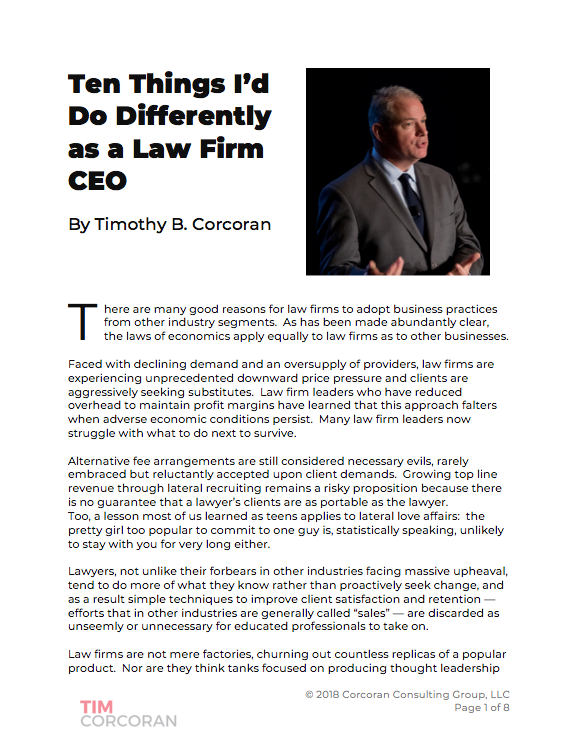 But as recent events have unquestionably demonstrated, large law firms are businesses too. And thus isn't the notion of deploying valuable and now limited resources, e.g., associates, to non-billable work a quaint notion at best, and irresponsible or even willful negligence? The traditional obstacles to promoting pro bono within a large law firm environment have usually focused more on practical matters rather than desire. No matter how many words I write about the need to embrace better business practices, I hope I never see the day when lawyers stop acting out of a sense of duty to their community and profession and cease pro bono activities because it's not profitable. Thankfully, large law firms by and large haven't taken this tone in the past, and I think with proper expectation setting, it won't be a problem in the future. Associates on the partner track, or at least those hoping to maximize bonuses, struggle to maintain the proper balance between billable hours and other duties, such as professional development, pro bono and client development. Through long effort, pro bono coordinators have succeeded in achieving parity between an hour spent on pro bono activities and an hour of billable client work. In other words, within reason spending time on a pro bono case counts toward billable hour quotas. The challenges now come from many fronts: with a substantial increase in alternative fee arrangements, reward and recognition systems based on billable hours will need updating, and the pro bono lobby may not have as strong a voice as they did when times were flush. The occasional partner who railed against the opportunity cost of diverting a valued associate away from client work may have an audience now, when associates are in shorter supply. But these challenges also present opportunities. Partners who have raised the opportunity cost argument tend to ignore the fact that defining a law firm's revenue potential under a billable hour model, e.g., the number of timekeepers multiplied by the billable hour rate multiplied by working hours available, imposes a greater opportunity cost than a law firm offering alternative fee arrangements. Simple math suggests that if I can negotiate sufficient simultaneous alternative fee projects which generate fees regardless of the time invested, I have the potential to generate greater revenues than those with a self-imposed ceiling. Furthermore, adopting tactics to improve efficiency so we can take on more alternative fee projects will lower our costs and improve profitability. This isn't a rant against the billable hour (others are more eloquent on the topic than I) but an observation that a movement away from the billable hour doesn't necessarily lead to lower revenues and profits. In fact, in light of the ACC/Serengeti survey released at the Association of Corporate Counsel's annual meeting, which declared that controlling outside counsel spend is the primary concern of in-house counsel, the reality is that moving away from the billable hour and toward more efficient operating models is now a requirement for all but a handful of firms. And no, odds are that despite your innate pride in your firm, yours is not in that handful. As clients demand efficiency, there are other downstream impacts. For example, partners can't overstaff projects with associates-in-training, simultaneously delivering an education and generating fee income, compliments of the client. This has led to an unprecedented number of associate layoffs, and a reversal of the impressive pay packages offered to Biglaw associates. Equally impacted, but less newsworthy, is the loss of training opportnity for the associates who remain. Will large law firms adopt the UK model, where an investment in PSLs (professional support lawyers) is far more common? Will they return to the guild approach of apprenticeship? Most firms will not make such revolutionary changes, at least not right away. Cue pro bono, entering stage left. In what other venue might an associate obtain an opportunity to cross-examine a hostile witness, learn how to navigate the endless bureauracy of a government agency, make decisions on the fly that, in some cases, have real life or death consequences? The answer is, of course, pro bono. To be clear, most pro bono work is less than glamorous, and you can only derive so much experience from helping a senior citizen file a social security disability claim. But such as it is, this experience now has to come from somewhere. As the business challenges of large law make headlines, some have predicted the end to the quality of life concern, or to the need for law firm diversity, or to the need for pro bono. After all, with fewer associates we can only rely on those who are willing to pull all-nighters and stay on the treadmill that leads to the partner track, even if only a fraction will actually make partner. And with clients focused on cost, won't the client be more interested in our fee than in how many women partners we have, or how many hours we devoted to pro bono last year? Perhaps. But I doubt it. The lesson of recent events is that corporate counsel must accept that the legal function is like any other, and must adopt the practices of the other functions. So if the corporation has a requirement for diversity in its suppliers, then despite the complications such a constraint imposes on the selection of outside counsel, the GC must find an outside law firm that has both the proper diversity footprint and an acceptable fee range. Managing multiple and often competing constraints is what leaders of businesses do all day, every day. So if pro bono, like diversity, will persist as a requirement in coming RFPs, why do so few law firms take the time to establish a well-oiled process for maintaining a record of pro bono achievement? It's not an uncommon occurrence in law firms for the various functions to, shall we say, not get along famously. Far too often, for example, the IT organization doesn't appreciate the marketing department acquiring new technology. The Marketing department doesn't appreciate being asked to run events for the Diversity team. The pro bono team promotes the firm's efforts without the assistance of the firm's public relations specialists, and so on. This must end. A holistic approach is needed. My advice to pro bono counsel is to embrace the opportunity to help inform the conversation as compensation systems come under review in this alternative fee world. Ensure that all marketers involved in responding to an RFP or otherwise promoting the firm's accomplishments have an up-to-the-minute scorecard of the firm's pro bono activities. Ensure that the professional development team, what's left of them, has full insight into the sorts of experiences the associates are gaining in their pro bono efforts, which could perhaps become certified for professional development credit. Engage the CFO in terms that she or he can understand about the quantitative impact of pro bono: How many RFPs required a pro bono scorecard? What was the value of these projects? How well do pro bono-experienced associates perform in client satisfaction interviews (you do these, right?) as compared to associates who have no pro bono experience? Which clients and targets, specifically, have a pro bono policy for their outside counsel suppliers, and which really mean it? If you're not sure, ask them. I am a fan of pro bono and find it to be one of the most appealing aspects of the legal profession, and even as I counsel law firm leaders to become better business people, I do not want to see efforts like this fall to the wayside in a quest for profits. I am now a fan of pro bono counsel, who have the passion, energy and desire to accomplish their mission in these challenging times. If you don't know your pro bono coordinator in your firm, drop in and say hello. I assure you, you'll be pleasantly surprised by how capable and willing they are to engage in the improvement of this profession. Update: I just learned that this is National Pro Bono Celebration week. Who knew?! Several notable names in the legal community have spoken up in support of pro bono, even during these trying times.